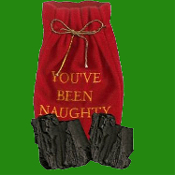 Red Velour Bag Mini Santa Sack with Three Faux Coal Lumps. Red sack with three artificial fake lumps of coal. Fake coal sack includes an embroidered draw string red velour gift pouch and 3 pieces of realistic-looking black lumps of coal.